PEOPLE WHO FIGHT DOGS ENGAGE IN ANIMAL CRUELTY. It is a human action. THE VICTIM of the crime of dog fighting IS THE DOG. Jackie Blue is why we do the work we do. 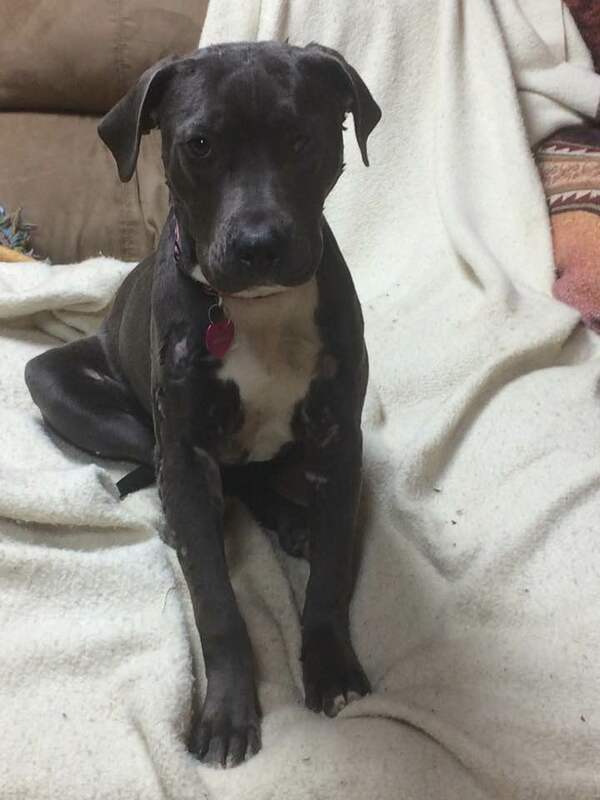 Jackie came into our local shelter as a 'stray', but we can tell from the scars there body carries that this blue gal is lucky to have escaped with her life. You see, there's no way to say Jackie wasn't fought, the scaring all over her body is in different stages of healing. She still had immediate injuries that needed treatment when we rescued her, like the gash underneath her arm. We rescued Jackie on December 29, 2016. Her foster mom was volunteering at the shelter, met Jackie and knew that she had to save this gentle soul. So Jackie was saved from the 'rescue only' list and taken to the farm. In the last 30 days Jackie has started to heal emotionally and physically. Jackie's emotional wounds are the hardest for us to see but she is learning to trust humans and dogs again. She loves the barn cat! Jackie has been vetted and spayed. We knew that the vet visit and surgery would set Jackie back a little because she would be in pain afterwards because of the experience, but Jackie did great. She did not like the elizabethan collar at all and was mostly upset and scared when she had to wear it, so you know what her foster mom did, she supervised Jackie herself to make sure Jackie left the incision alone and didn't have to wear the collar. Jackie's spirit has started to return. She's integrated into the Blues Sisters pack and her foster sisters Bella and Lucy take care of Jackie. Bella and Lucy groom Jackie and show compassion and companionship to her, they also provide a stable role model when Jackie is in situations that she feels unsafe she can see the Blues Sisters are okay with the situation and she adjusts better. 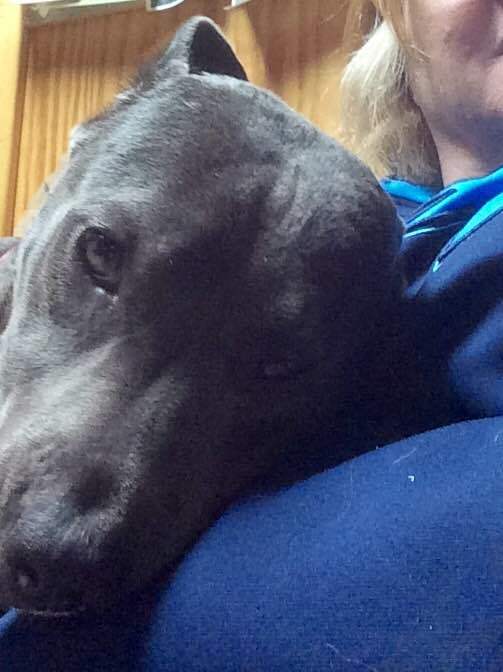 Jackie Blue is a gentle dog that does not deserve what was done to her at the hands of humans. We are 100% dedicated to her recovery and love watching her become the dog she was always meant to be. However, her long road to recover just got a little bit longer because last week when Jackie was running in the house she slipped and screamed. Her foster mom immediately knew something was wrong because she had never heard that sound out of Jackie and when she got to Jackie, Jackie wasn't bearing weight on one of her feet. A vet visit and x-ray later and it's confirmed Jackie has a completely torn ACL. Her $1,600 surgery is scheduled for February 10, 2017. Since she gets stressed in the crate her foster family has set up a x-pen corral to give her more space to stay safely contained during recovery. 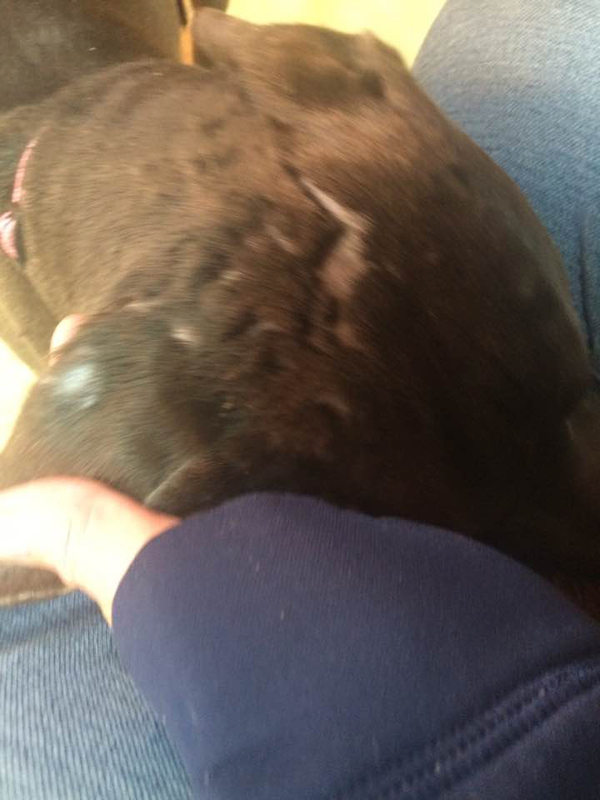 March Update - Today Jackie is one month out from her surgery and she's healing up nicely. The cold laser treatments really helped speed up Jackie's recovery. She's ready for spring and to be able to get out and romp with the blue crew again! We are so happy - Jackie Blue will be adopted by a family member of her foster! 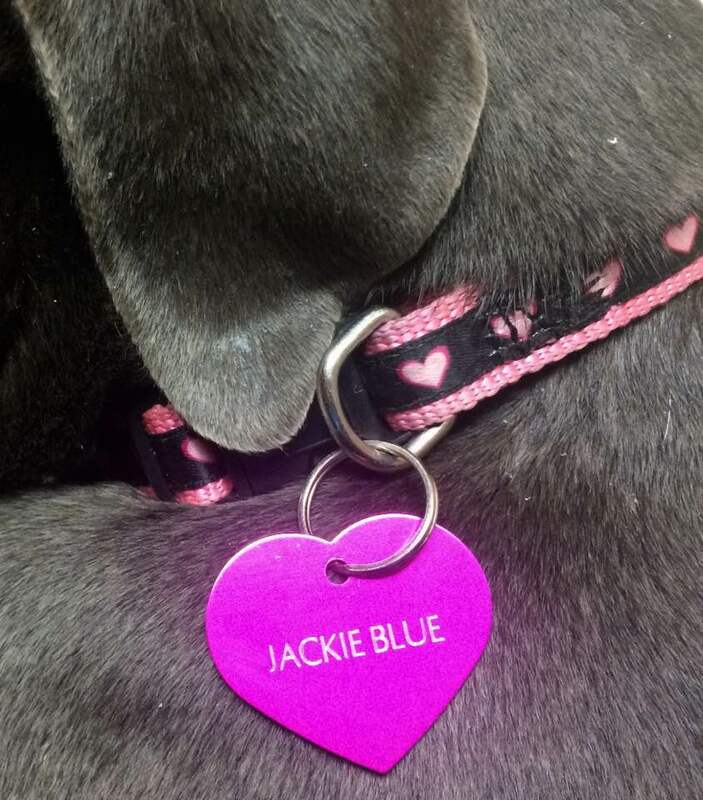 Saving a dog like Jackie Blue would not be possible without the work of a lot of people. 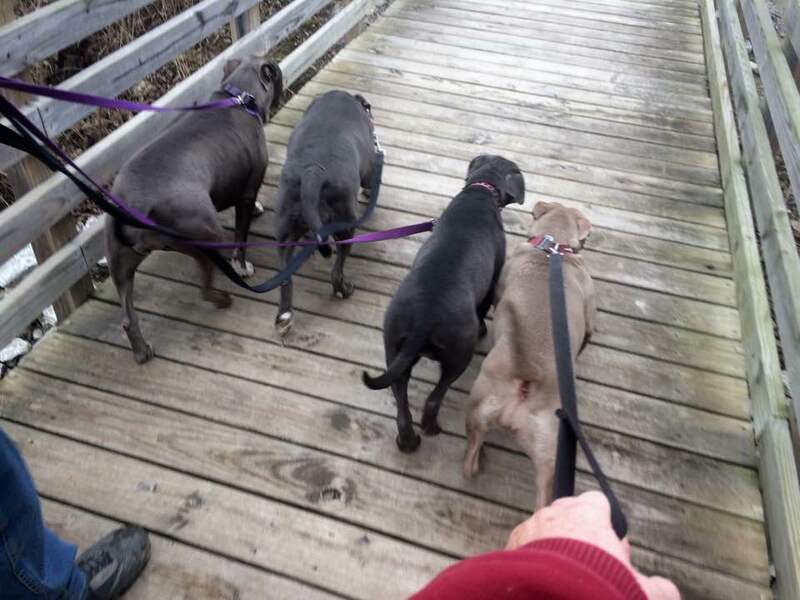 We're grateful for everyone's support and dedication to helping pit bulls that are in need. Complete an adoption application today to meet Jackie Blue!